With the truss rod installed, I was able to put my router away and return to the (much less terrifying) hand tool work I prefer. Next up was fitting the ebony veneer to the headstock. The bottom edge of the veneer had some significant splits, so I trimmed that edge with my Bad Axe carcass saw. Fortunately the veneer was significantly longer than I needed, so even having trimmed the split edge the veneer was plenty big enough for the headstock. As the veneer is only a couple of millimeters thick it is very flexible. My bench top is not flat enough to keep the veneer perfectly flat while planing the gluing surface, so instead I stuck the veneer to a sheet of 25mm thick ply wood using double sided sticky tape. Double sided tape is one of the secret tricks in my workshop, and is invaluable for working thin stock, holding gluing cauls in place, and securing router templates (on the few occasions I use my router). 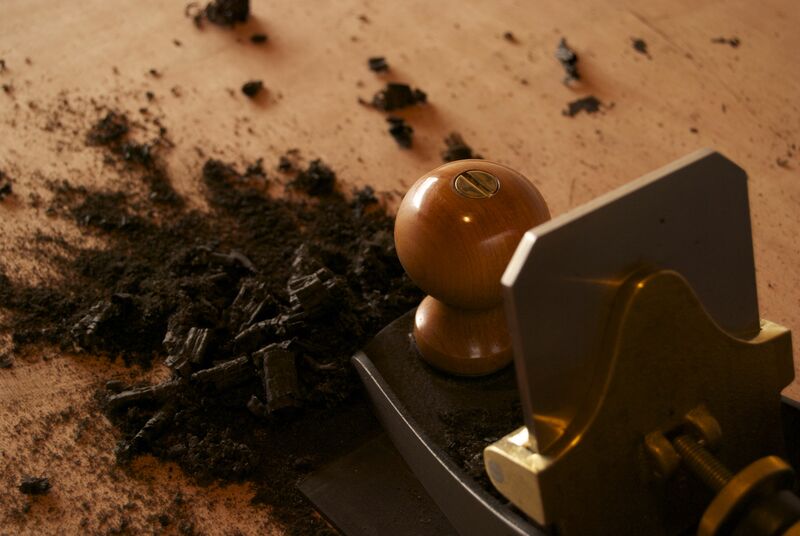 Once secured to the ply wood, the gluing surface of the veneer was then prepared with a Lie Nielsen No.212 Scraper plane. 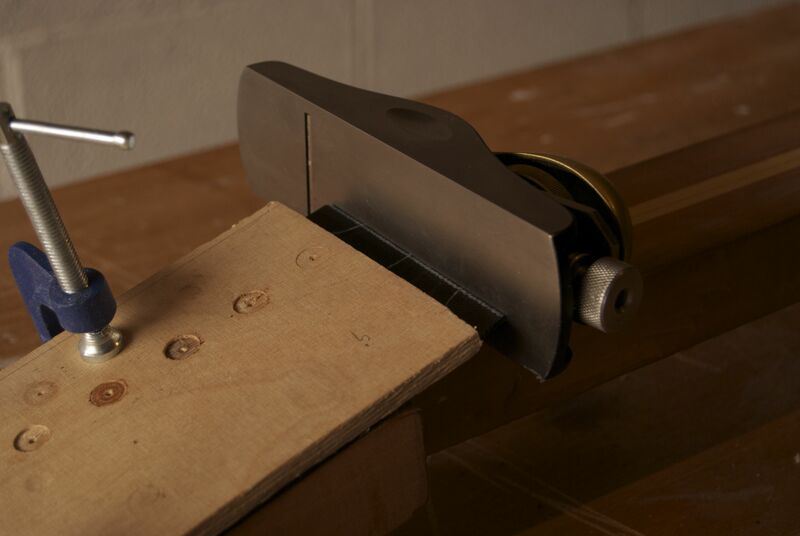 This plane is invaluable for the work I do, as it scrapes difficult exotic timber leaving a finish ready surface with no tear-out, and is one of the go to tool in my workshop when dealing with timber that would tear-out under a more conventional plane. The bottom edge of the headstock veneer needs to fit against the back edge of the nut with no gaps. 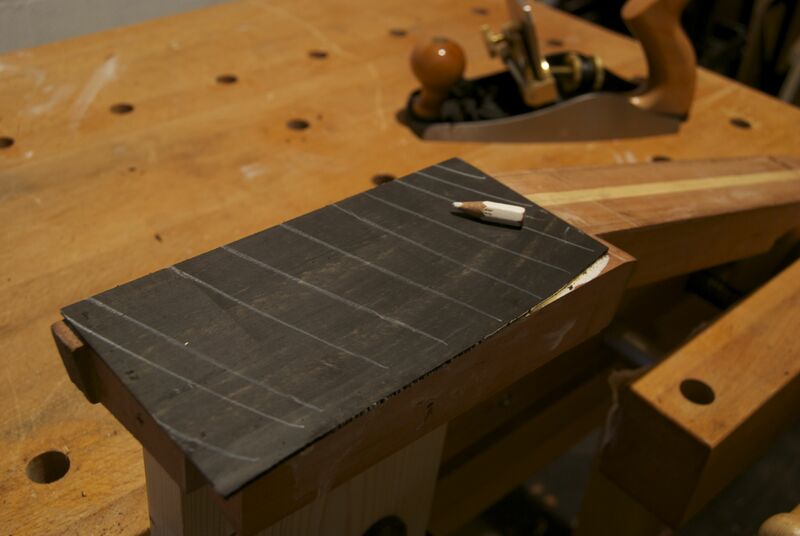 To do so it must be fitted in two directions: straight along the width of the headstock, and a chamfer planed into the thickness of the veneer so that the full thickness of the veneer buts up against the nut. Effectively, the chamfer is the angle of the headstock, plus 90 degrees, so that the resulting edge is perpendicular to the surface of the neck. 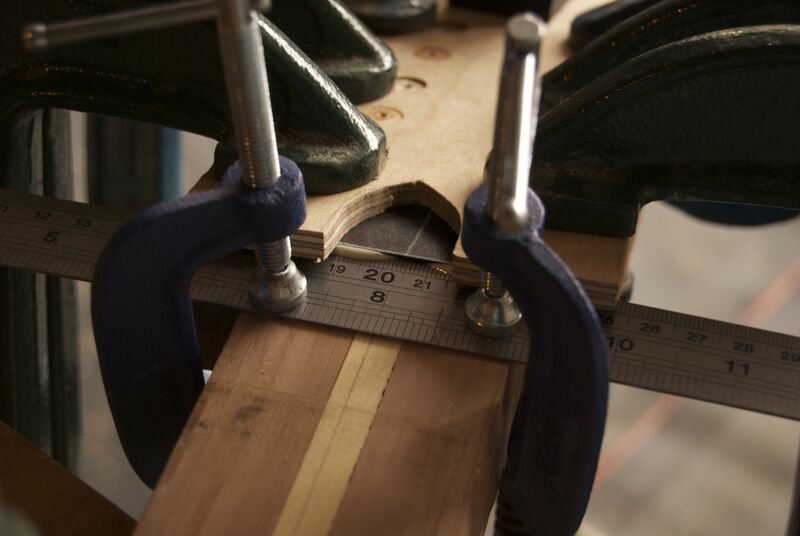 The best way to fit the bottom edge of the headstock veneer is to mount it on the headstock, projecting over the surface of the neck, and to shoot it using the neck to support the plane. This method ensures that as the veneer is straightened along the width, the correct angle is also planed into the thickness of the veneer by virtue of using the headstock itself as the reference surface. 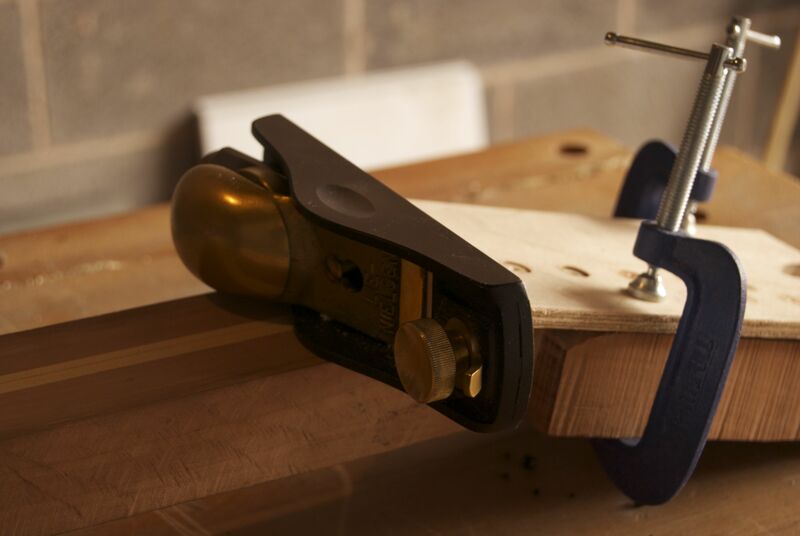 I use my Lie Nielsen block plane for this operation, as the short length of the plane makes it easy to balance on the neck, and the sides of the plane are ground to 90 degrees of the sole which guarantees the correct angle on the chamfer. Not all planes have their sides dead on 90 degrees to the sole, so do check before you carry this task as there is a risk of planing a chamfer with some funky angles if you use an older plane. And from a different angle… To glue the veneer to the headstock I clamped a 300mm steel rule to the neck so that it provided a reference edge against the back of the nut. The veneer was clamped under a caul to spread the clamping pressure, and left over night for the glue to cure. The veneer was broken out of the clamps once the glue had fully cured. I then flattened the face of the headstock, again using the scraper plane. 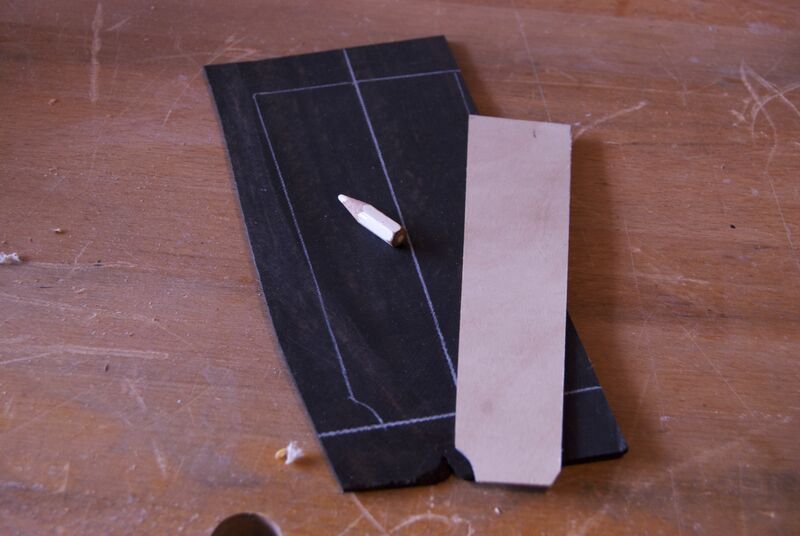 To check my progress with thin stock where I want to remove as little material as possible, I often draw across the entire surface to be planed. As the lines disappear it becomes clear where there are hollows in the surface, and where the high points are. The white pencil in the picture below has been with me since Totnes (8 years ago now! ), and I suspect it has very few sharpenings left! The headstock is now ready to be shaped, which I will write about next time.